Sanders, who was beaten in the 2016 Democratic presidential primaries by Hillary Clinton, made the announcement in advance of his release of 10 years worth of tax returns (when his net worth will become public, anyway). Of course, he didn’t release his own returns last time around, but now that he’s hoping to go against President Trump, he’s seeking to make the issue more prominent. “On the day in the very immediate future, certainly before April 15, we release ours, I hope that Donald Trump will do exactly the same. We are going to release 10 years of our tax returns, and we hope that on that day Donald Trump will do the same,” he told The New York Times. But Sanders defended himself against comparisons with Trump. “Not being a billionaire, not having investments in Saudi Arabia, wherever he has investments, all over the world, mine will be a little bit more boring,” he said. Senators make $174,000 a year, so it’s remarkable that Sanders could save enough to become a millionaire. On the other hand, that salary makes him a 4 Percenter, putting him in the top 4 percent of all incomes in the U.S. Plus, he’s been in Congress — first as a House member and then in the Senate — since shortly before there was electricity, so if he was frugal, he could amass a small fortune. And he has, apparently. 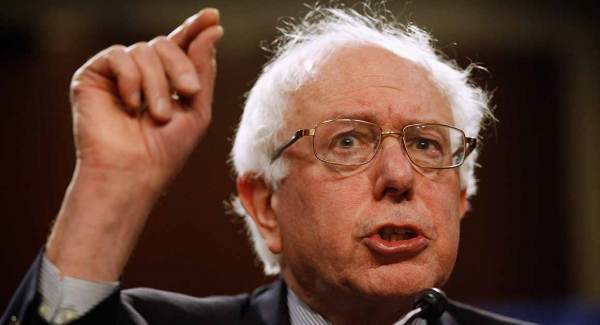 Vermont magazine “Seven Days” reported in 2016 that Sanders and his wife bought a four-bedroom house on the shore of Lake Champlain in Vermont — with 500 feet of lake frontage — for about $600,000. The Sanders own at least three houses, with another in Burlington, Vermont, and one on Capitol Hill in Washington, D.C.
Sanders talks about taxing everyone to death as he pushes for free everything for everybody — free health care, free college tuition, even free money in the form of universal basic income, in which the government collects taxpayer money and redistributes it. What’s hilarious is that Sanders has been railing at Trump, but the socialist paid a much lower percentage in taxes than the evil 1 Percenter Trump. When MSNBC’s Rachel Maddow got her hands on some tax forms, she devoted most of a program in 2017 to Trump’s two-page 1040 form from 2005. The documents showed Trump wrote off $100 million in business losses and paid $38 million in federal income taxes on adjusted income of $150 million, an effective tax rate of 25 percent. Sanders, the champion of The Little Man, paid $27,653 in federal income taxes in 2014 – an effective federal tax rate of 13.5 percent! As always with the Democrats, it’s do as I say, not as I do.